A champagne gold top model of Tata Nano, currently on display here, will stay in the US for one year during when it will travel across the country and be showcased at various events. The Nano, with a MH 04 ED 7015 licence plate, is on its maiden trip to the US and was unveiled at the Detroit Science Centre in Detroit on Friday. While in the US, the home-base of the Nano would be the Tata Technologies North American headquarters in Novi, Michigan, 'where it would be sitting in the lobby. The car will be in the US for one year,' Tata Technologies chief marketing officer Kevin Noe told PTI at the 'Better Innovation' event where the $2500 People's Car made its US debut. The Nano would also be showcased at New York's Cooper Hewitt National Design Museum on February 18. The event in New York is not going to be a car event, he said, adding that Cooper Hewitt is a museum of design and Nano would be displayed there to showcase its innovative design. 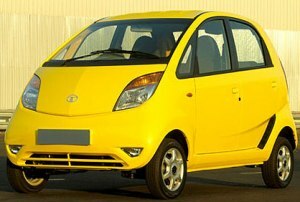 Apart from the champagne gold Nano, which is on loan from Tata Technologies' Center for Advanced Engineering and Design in Pune India, a yellow Nano too has come from India to the US. Noe said the company had applied for 'Carnet' application, that allows it to bring the vehicle into the US temporarily. During its one-year stay in the US, Tata Technologies is looking at about '9-10 events', including the global exposition of automotive design engineering SAE World Congress, East and West Coast Design Shows, private customer screenings and conferences to display the Nano and get a feedback from American customers on what they want in the Nano when it hits US markets. "We also want to showcase our contribution to the vehicle. Such events will give us an opportunity to get a lot of feedback for the car," Noe said, adding that through these displays the Tata brand will be able to expand and grow in North America. Nano arrived in the US on January 1. It began its journey from Denver, Colorado, earlier this week and reached Detroit a couple of days ago. It has already made a stop at the Judson University in Elgin near Chicago, where 200 people, including students, government officials and local residents had gathered to see what the world's cheapest car looks like. Noe reiterated that for the Nano to enter the US market, it would have to meet US safety and emission standards, which are more stringent than the Indian and European standards. Tata Group chairman Ratan Tata has said he plans to bring the Nano to the US customer in three years. Tata officials at the Better Innovation event did not say by when the Nano would enter the US market.